coeff = pca(X) returns the principal component coefficients, also known as loadings, for the n-by-p data matrix X. Rows of X correspond to observations and columns correspond to variables. The coefficient matrix is p-by-p. Each column of coeff contains coefficients for one principal component, and the columns are in descending order of component variance. By default, pca centers the data and uses the singular value decomposition (SVD) algorithm. coeff = pca(X,Name,Value) returns any of the output arguments in the previous syntaxes using additional options for computation and handling of special data types, specified by one or more Name,Value pair arguments. For example, you can specify the number of principal components pca returns or an algorithm other than SVD to use. [coeff,score,latent] = pca(___) also returns the principal component scores in score and the principal component variances in latent. You can use any of the input arguments in the previous syntaxes. Principal component scores are the representations of X in the principal component space. Rows of score correspond to observations, and columns correspond to components. The principal component variances are the eigenvalues of the covariance matrix of X. [coeff,score,latent,tsquared] = pca(___) also returns the Hotelling's T-squared statistic for each observation in X. [coeff,score,latent,tsquared,explained,mu] = pca(___) also returns explained, the percentage of the total variance explained by each principal component and mu, the estimated mean of each variable in X. The ingredients data has 13 observations for 4 variables. Find the principal components for the ingredients data. The rows of coeff contain the coefficients for the four ingredient variables, and its columns correspond to four principal components. Find the principal component coefficients when there are missing values in a data set. Data matrix X has 13 continuous variables in columns 3 to 15: wheel-base, length, width, height, curb-weight, engine-size, bore, stroke, compression-ratio, horsepower, peak-rpm, city-mpg, and highway-mpg. The variables bore and stroke are missing four values in rows 56 to 59, and the variables horsepower and peak-rpm are missing two values in rows 131 and 132. By default, pca performs the action specified by the 'Rows','complete' name-value pair argument. This option removes the observations with NaN values before calculation. Rows of NaNs are reinserted into score and tsquared at the corresponding locations, namely rows 56 to 59, 131, and 132. Use 'pairwise' to perform the principal component analysis. In this case, pca computes the (i,j) element of the covariance matrix using the rows with no NaN values in the columns i or j of X. Note that the resulting covariance matrix might not be positive definite. This option applies when the algorithm pca uses is eigenvalue decomposition. When you don’t specify the algorithm, as in this example, pca sets it to 'eig'. If you require 'svd' as the algorithm, with the 'pairwise' option, then pca returns a warning message, sets the algorithm to 'eig' and continues. If you use the 'Rows','all' name-value pair argument, pca terminates because this option assumes there are no missing values in the data set. Raw data contains NaN missing value while 'Rows' option is set to 'all'. Consider using 'complete' or pairwise' option instead. Use the inverse variable variances as weights while performing the principal components analysis. Perform the principal component analysis using the inverse of variances of the ingredients as variable weights. Note that the coefficient matrix, wcoeff, is not orthonormal. Calculate the orthonormal coefficient matrix. Check orthonormality of the new coefficient matrix, coefforth. Find the principal components using the alternating least squares (ALS) algorithm when there are missing values in the data. 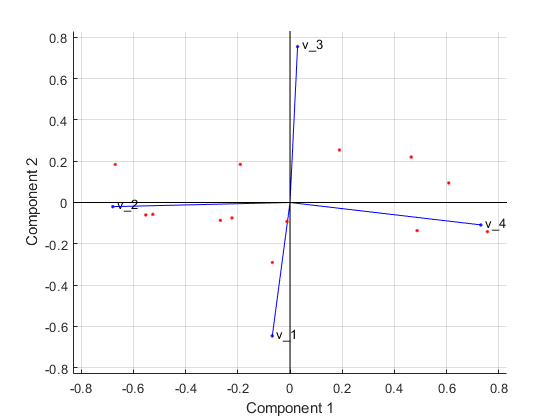 Perform principal component analysis using the ALS algorithm and display the component coefficients. Approximately 30% of the data has missing values now, indicated by NaN. The ALS algorithm estimates the missing values in the data. Another way to compare the results is to find the angle between the two spaces spanned by the coefficient vectors. Find the angle between the coefficients found for complete data and data with missing values using ALS. This is a small value. It indicates that the results if you use pca with 'Rows','complete' name-value pair argument when there is no missing data and if you use pca with 'algorithm','als' name-value pair argument when there is missing data are close to each other. Perform the principal component analysis using 'Rows','complete' name-value pair argument and display the component coefficients. In this case, pca removes the rows with missing values, and y has only four rows with no missing values. pca returns only three principal components. You cannot use the 'Rows','pairwise' option because the covariance matrix is not positive semidefinite and pca returns an error message. Find the angle between the coefficients found for complete data and data with missing values using listwise deletion (when 'Rows','complete'). The angle between the two spaces is substantially larger. This indicates that these two results are different. In this case, the mean is just the sample mean of y. This shows that deleting rows containing NaN values does not work as well as the ALS algorithm. Using ALS is better when the data has too many missing values. Find the coefficients, scores, and variances of the principal components. Find the principal component coefficients, scores, and variances of the components for the ingredients data. Each column of score corresponds to one principal component. The vector, latent, stores the variances of the four principal components. Reconstruct the centered ingredients data. The new data in Xcentered is the original ingredients data centered by subtracting the column means from corresponding columns. 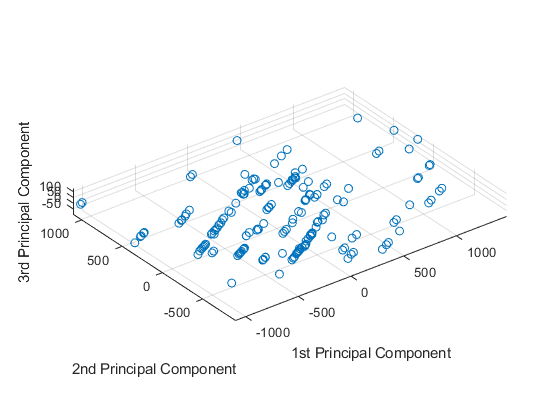 Visualize both the orthonormal principal component coefficients for each variable and the principal component scores for each observation in a single plot. All four variables are represented in this biplot by a vector, and the direction and length of the vector indicate how each variable contributes to the two principal components in the plot. For example, the first principal component, which is on the horizontal axis, has positive coefficients for the third and fourth variables. Therefore, vectors v3 and v4 are directed into the right half of the plot. The largest coefficient in the first principal component is the fourth, corresponding to the variable v4. The second principal component, which is on the vertical axis, has negative coefficients for the variables v1, v2, and v4, and a positive coefficient for the variable v3. This 2-D biplot also includes a point for each of the 13 observations, with coordinates indicating the score of each observation for the two principal components in the plot. For example, points near the left edge of the plot have the lowest scores for the first principal component. The points are scaled with respect to the maximum score value and maximum coefficient length, so only their relative locations can be determined from the plot. Find the Hotelling’s T-squared statistic values. Perform the principal component analysis and request the T-squared values. Request only the first two principal components and compute the T-squared values in the reduced space of requested principal components. Note that even when you specify a reduced component space, pca computes the T-squared values in the full space, using all four components. The T-squared value in the reduced space corresponds to the Mahalanobis distance in the reduced space. Calculate the T-squared values in the discarded space by taking the difference of the T-squared values in the full space and Mahalanobis distance in the reduced space. Find the percent variability explained by the principal components. Show the data representation in the principal components space. Data matrix X has 13 continuous variables in columns 3 to 15: wheel-base, length, width, height, curb-weight, engine-size, bore, stroke, compression-ratio, horsepower, peak-rpm, city-mpg, and highway-mpg. Find the percent variability explained by principal components of these variables. The first three components explain 99.95% of all variability. Visualize the data representation in the space of the first three principal components. The data shows the largest variability along the first principal component axis. This is the largest possible variance among all possible choices of the first axis. The variability along the second principal component axis is the largest among all possible remaining choices of the second axis. The third principal component axis has the third largest variability, which is significantly smaller than the variability along the second principal component axis. The fourth through thirteenth principal component axes are not worth inspecting, because they explain only 0.05% of all variability in the data. Find the principal components for one data set and apply the PCA to another data set. This procedure is useful when you have a training data set and a test data set for a machine learning model. For example, you can preprocess the training data set by using PCA and then train a model. To test the trained model using the test data set, you need to apply the PCA transformation obtained from the training data to the test data set. This example also describes how to generate C/C++ code. Because pca supports code generation, you can generate code that performs PCA using a training data set and apply the PCA to a test data set. Then deploy the code to a device. In this workflow, you must pass training data, which can be of considerable size. To save memory on the device, you can separate training and prediction. Use pca in MATLAB® and apply PCA to new data in the generated code on the device. Load the data set into a table by using readtable. The data set is in the file CreditRating_Historical.dat, which contains the historical credit rating data. The first column is an ID of each observation, and the last column is a rating. Specify the second to seventh columns as predictor data and specify the last column (Rating) as the response. Use the first 100 observations as test data and the rest as training data. Find the principal components for the training data set XTrain. This code returns four outputs: coeff, scoreTrain, explained, and mu. Use explained (percentage of total variance explained) to find the number of components required to explain at least 95% variability. Use coeff (principal component coefficients) and mu (estimated means of XTrain) to apply the PCA to a test data set. Use scoreTrain (principal component scores) instead of XTrain when you train a model. Display the percent variability explained by the principal components. The first two components explain more than 95% of all variability. Programmatically find the number of components required to explain at least 95% variability by using a while loop. Train a classification tree using the first two components. mdl is a ClassificationTree model. To use the trained model for the test set, you need to transform the test data set by using the PCA obtained from the training data set. Obtain the principal component scores of the test data set by subtracting mu from XTest and multiplying by coeff. Only the scores for the first two components are necessary, so use the first two coefficients coeff(:,1:idx). Pass the trained model mdl and the transformed test data set scoreTest to the predict function to predict ratings for the test set. 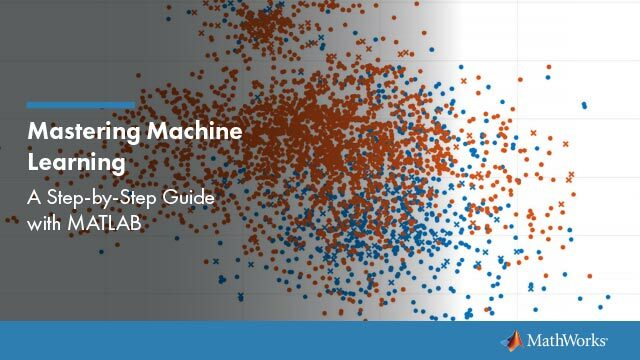 Generate code that applies PCA to data and predicts ratings using the trained model. Note that generating C/C++ code requires MATLAB® Coder™. Save the classification model to the file myMdl.mat by using saveCompactModel. Define an entry-point function named myPCAPredict that accepts a test data set (XTest) and PCA information (coeff and mu) and returns the ratings of the test data. myPCAPredict applies PCA to new data using coeff and mu, and then predicts ratings using the transformed data. In this way, you do not pass training data, which can be of considerable size. Generate code by using codegen. Because C and C++ are statically typed languages, you must determine the properties of all variables in the entry-point function at compile time. To specify the data type and exact input array size, pass a MATLAB® expression that represents the set of values with a certain data type and array size by using the -args option. If the number of observations is unknown at compile time, you can also specify the input as variable-size by using coder.typeof. For details, see Specify Variable-Size Arguments for Code Generation. codegen generates the MEX function myPCAPredict_mex with a platform-dependent extension. isequal returns logical 1 (true), which means all the inputs are equal. The comparison confirms that the predict function of mdl and the myPCAPredict_mex function return the same ratings. For more information on code generation, see Introduction to Code Generationand Code Generation and Classification Learner App. The latter describes how to perform PCA and train a model by using the Classification Learner app, and how to generate C/C++ code that predicts labels for new data based on the trained model. Input data for which to compute the principal components, specified as an n-by-p matrix. Rows of X correspond to observations and columns to variables. Example: 'Algorithm','eig','Centered',false,'Rows','all','NumComponents',3 specifies that pca uses eigenvalue decomposition algorithm, not center the data, use all of the observations, and return only the first three principal components. Principal component algorithm that pca uses to perform the principal component analysis, specified as the comma-separated pair consisting of 'Algorithm' and one of the following. 'svd' Default. Singular value decomposition (SVD) of X. 'eig' Eigenvalue decomposition (EIG) of the covariance matrix. The EIG algorithm is faster than SVD when the number of observations, n, exceeds the number of variables, p, but is less accurate because the condition number of the covariance is the square of the condition number of X. Alternating least squares (ALS) algorithm. This algorithm finds the best rank-k approximation by factoring X into a n-by-k left factor matrix, L, and a p-by-k right factor matrix, R, where k is the number of principal components. The factorization uses an iterative method starting with random initial values. ALS is designed to better handle missing values. It is preferable to pairwise deletion ('Rows','pairwise') and deals with missing values without listwise deletion ('Rows','complete'). It can work well for data sets with a small percentage of missing data at random, but might not perform well on sparse data sets. Indicator for centering the columns, specified as the comma-separated pair consisting of 'Centered' and one of these logical expressions. Default. pca centers X by subtracting column means before computing singular value decomposition or eigenvalue decomposition. If X contains NaN missing values, nanmean is used to find the mean with any available data. You can reconstruct the centered data using score*coeff'. In this case pca does not center the data. You can reconstruct the original data using score*coeff'. Indicator for the economy size output when the degrees of freedom, d, is smaller than the number of variables, p, specified as the comma-separated pair consisting of 'Economy' and one of these logical expressions. Default. pca returns only the first d elements of latent and the corresponding columns of coeff and score. This option can be significantly faster when the number of variables p is much larger than d.
pca returns all elements of latent. The columns of coeff and score corresponding to zero elements in latent are zeros. Note that when d < p, score(:,d+1:p) and latent(d+1:p) are necessarily zero, and the columns of coeff(:,d+1:p) define directions that are orthogonal to X. Number of components requested, specified as the comma-separated pair consisting of 'NumComponents' and a scalar integer k satisfying 0 < k ≤ p, where p is the number of original variables in X. When specified, pca returns the first k columns of coeff and score. Action to take for NaN values in the data matrix X, specified as the comma-separated pair consisting of 'Rows' and one of the following. Default. Observations with NaN values are removed before calculation. Rows of NaNs are reinserted into score and tsquared at the corresponding locations. This option only applies when the algorithm is 'eig'. If you don’t specify the algorithm along with 'pairwise', then pca sets it to 'eig'. If you specify 'svd' as the algorithm, along with the option 'Rows','pairwise', then pca returns a warning message, sets the algorithm to 'eig' and continues. When you specify the 'Rows','pairwise' option, pca computes the (i,j) element of the covariance matrix using the rows with no NaN values in the columns i or j of X. Note that the resulting covariance matrix might not be positive definite. In that case, pca terminates with an error message. X is expected to have no missing values. pca uses all of the data and terminates if any NaN value is found. Observation weights, specified as the comma-separated pair consisting of 'Weights' and a vector of length n containing all positive elements. Variable weights, specified as the comma-separated pair consisting of 'VariableWeights' and one of the following. Vector of length p containing all positive elements. The variable weights are the inverse of sample variance. If you also assign weights to observations using 'Weights', then the variable weights become the inverse of weighted sample variance. If 'Centered' is set to true at the same time, the data matrix X is centered and standardized. In this case, pca returns the principal components based on the correlation matrix. Initial value for the coefficient matrix coeff, specified as the comma-separated pair consisting of 'Coeff0' and a p-by-k matrix, where p is the number of variables, and k is the number of principal components requested. You can use this name-value pair only when 'algorithm' is 'als'. Initial value for scores matrix score, specified as a comma-separated pair consisting of 'Score0' and an n-by-k matrix, where n is the number of observations and k is the number of principal components requested. Options for the iterations, specified as a comma-separated pair consisting of 'Options' and a structure created by the statset function. pca uses the following fields in the options structure. 'Display' Level of display output. Choices are 'off', 'final', and 'iter'. 'MaxIter' Maximum number steps allowed. The default is 1000. Unlike in optimization settings, reaching the MaxIter value is regarded as convergence. 'TolFun' Positive number giving the termination tolerance for the cost function. The default is 1e-6. 'TolX' Positive number giving the convergence threshold for the relative change in the elements of the left and right factor matrices, L and R, in the ALS algorithm. The default is 1e-6. You can change the values of these fields and specify the new structure in pca using the 'Options' name-value pair argument. Principal component coefficients, returned as a p-by-p matrix. Each column of coeff contains coefficients for one principal component. The columns are in the order of descending component variance, latent. Principal component scores, returned as a matrix. Rows of score correspond to observations, and columns to components. Principal component variances, that is the eigenvalues of the covariance matrix of X, returned as a column vector. Hotelling’s T-Squared Statistic, which is the sum of squares of the standardized scores for each observation, returned as a column vector. Percentage of the total variance explained by each principal component, returned as a column vector. Estimated means of the variables in X, returned as a row vector when Centered is set to true. When Centered is false, the software does not compute the means and returns a vector of zeros. Hotelling’s T-squared statistic is a statistical measure of the multivariate distance of each observation from the center of the data set. For the T-squared statistic in the reduced space, use mahal(score,score). For the T-squared statistic in the discarded space, first compute the T-squared statistic using [coeff,score,latent,tsquared] = pca(X,'NumComponents',k,...), compute the T-squared statistic in the reduced space using tsqreduced = mahal(score,score), and then take the difference: tsquared - tsqreduced. n is the number of rows without any NaNs if you use 'Rows','complete'. n is the number of rows without any NaNs in the column pair that has the maximum number of rows without NaNs if you use 'Rows','pairwise'. Note that when variable weights are used, the coefficient matrix is not orthonormal. Suppose the variable weights vector you used is called varwei, and the principal component coefficients vector pca returned is wcoeff. You can then calculate the orthonormal coefficients using the transformation diag(sqrt(varwei))*wcoeff. Jolliffe, I. T. Principal Component Analysis. 2nd ed., Springer, 2002. Krzanowski, W. J. Principles of Multivariate Analysis. Oxford University Press, 1988. Seber, G. A. F. Multivariate Observations. Wiley, 1984. Jackson, J. E. A. User's Guide to Principal Components. Wiley, 1988. Roweis, S. “EM Algorithms for PCA and SPCA.” In Proceedings of the 1997 Conference on Advances in Neural Information Processing Systems. Vol.10 (NIPS 1997), Cambridge, MA, USA: MIT Press, 1998, pp. 626–632. Ilin, A., and T. Raiko. “Practical Approaches to Principal Component Analysis in the Presence of Missing Values.” J. Mach. Learn. Res.. Vol. 11, August 2010, pp. 1957–2000. pca works directly with tall arrays by computing the covariance matrix and using the in-memory pcacov function to compute the principle components. Name-value pair arguments are not supported. When 'Algorithm' is 'als', the 'Display' value for 'Options' is ignored. If supplied, 'Weights' and 'VariableWeights' must be real. The generated code always returns the fifth output explained as a column vector. The generated code always returns the sixth output mu as a row vector. If mu is empty, pca returns mu as a 1-by-0 array. pca does not convert mu to a 0-by-0 empty array. The generated code does not treat an input matrix X that has all NaN values as a special case. The output dimensions are commensurate with corresponding finite inputs. To save memory on the device to which you deploy generated code, you can separate training (constructing PCA components from input data) and prediction (performing PCA transformation). Construct PCA components in MATLAB®. Then, define an entry-point function that performs PCA transformation using the principal component coefficients (coeff) and estimated means (mu), which are the outputs of pca. Finally, generate code for the entry-point function. For an example, see Apply PCA to New Data and Generate C/C++ Code.